Wow such a FABULOUS skirt..so pretty. 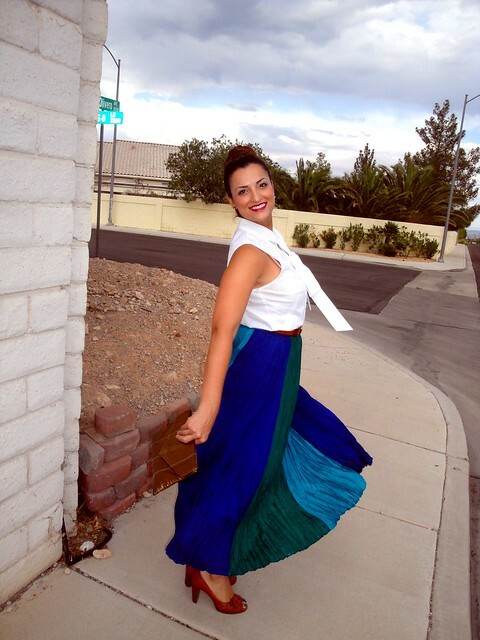 Your skirt is an amazing thrifted find! Incredible and unique. You can wear it with many different colors. 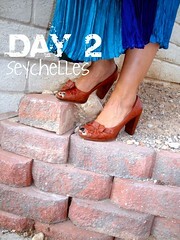 And the seychelles are adorable. love your outfit! your top is really cute! you look gorgeous, I like your skirt, it's fabulous! I love the different shades of blue on the skirt. I also like your gold accents on the outfit, they totally up the glam factor. The top is so feminine chic. Great outfit! That skirt is stunning!!! I finally found a really long glorious leopard skirt at Goodwill a few months back and it drives me nuts!! I trip and step on it and usually take it off ASAP!! Lovely hues on that skirt! You have a fab blog. I'm now following! Those shoes are gorgeous! Love long skirts....I'm kind of addicted. WOW! Your skirt + top are gorgeous. You seriously have the best eye for thrifting. That skirt is GREAT! Nice find. That skirt is LOVE! It is gorgeous, I love how you paired it with simplistic yet equally beautiful pieces to let that stunning skirt stand out!